Yamaha MCR-140 review | What Hi-Fi? If there were a world record for the number of colour-ways for a product, then this Yamaha micro system would definitely have a shot. With no fewer than 10 different hues to choose from, even the harshest of colour critics should be satisfied. An abundance of colourful finishes isn't the only selling point of the MCR-140. 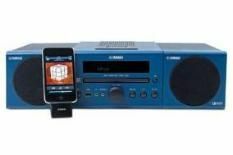 The main receiver includes a CD player and DAB/FM radio. The system also features a new version of Yamaha's AirWired wireless streaming technology. If you own an iPod or iPhone, you can plug it into the supplied transmitter and stream music wirelessly. Yamaha claims that this new version of AirWired allows you to stream music with greater accuracy. The micro is certainly quick to react to commands from the transmitter – slide the volume bar on an iPod Touch and the response is instantaneous and smooth. The MCR-140 sports a compact stance mainly due to the detachable speakers, which launch far greater bass weight than you might expect. Spin Lady Gaga's Bad Romance and the system sparks into life, displaying admirable enthusiasm and drive. During the chorus, bass notes make a substantial impact and the system displays good dynamics. The only downside is a coarse, grating edge to Gaga's vocal and high frequencies. The top systems at this price offer greater refinement, but the MCR-140 is still a neat, multi-functional micro system.